Ace Crawford Private Eye - Do You Remember? Tim Conway played Ace Crawford, a private detective/investigator... a not very good private detective/investigator. In one episode they were in the bar where they hang out and a pretty lady accidentally broke her pearl necklace so she put the pearls in a bowl on the counter for a moment. Ace came up and started eating them thinking they were peanuts and complaining that they were too crunchy! Another episode found Ace going undercover in a retirement home, posing as one of the patients. He was walking too slowly in the corridor so the nurse told him to hurry up. He didn't speed up, just shuffled his feet faster, still going at the same speed. I remember my mother laughing at that. She doesn't laugh that much at stuff on television so it must have been funny. In that same episode he was chatting to one of the residents going on about how he used to play tricks on people when he was younger (remember he was still disguised as a pensioner) and the other resident took offence, called him some choice names and smacked him about a bit! All in all, good clean fun, and child-friendly humour. 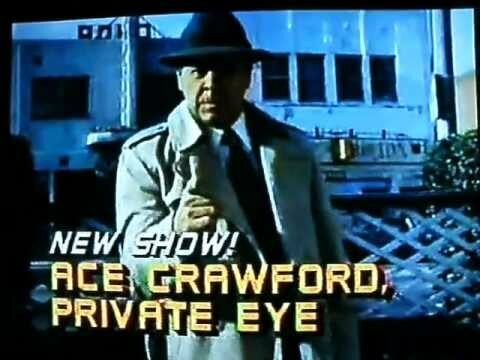 Do You Remember Ace Crawford Private Eye?